Don’t feel like cooking this year? Sometimes the best thing to be thankful for is a clean kitchen, and that’s why some of Atlanta’s top restaurants and retailers are providing Atlantans some delicious dining alternatives for Thanksgiving. Ranging from buffets to multi-course dinners and take-away options, below is a savory sampling of offerings this holiday. Avoid holiday stress and join BLT Steak as family comes first this Thanksgiving. For guests interested in a Thanksgiving meal with a fine dining twist, BTL Steak Atlanta will open its dining room from 1pm to 7pm on November 27. A specialty pre fixe menu prepared by Chef de Cuisine Joseph Macy will include everyone’s favorite traditional dishes, but with BLT Steak flare. Look forward to starters such as the kabocha squash risotto with saffron, pumpkin seeds and pecorino, and the Gem Salad with parsnip, squash and cider vinaigrette. As a main course, select from the roasted turkey with chestnut sausage stuffing, cranberry-grenadine sauce and rosemary gravy, dry aged roasted prime rib with confit garlic jus and caramelized onion bread pudding, or striped bass with Brussels sprouts, kohlrabi and cranberry. Thanksgiving wouldn’t be complete without indulging in desserts such as the cranberry spiced bread pudding with walnuts and cranberry coulis, a pumpkin tart with maple ice cream, or velvet chocolate rocky road with vanilla anglaise and hazelnuts. The prix fixe menu starts at $50 for adults and $35 for children. 10th & Piedmont and G’s Midtown are both hosting signature Thanksgiving buffets from 10 a.m. to 10 p.m. For only $34.95 per adult and $13.95 for children 10 years old and younger, guests can enjoy an array of traditional Thanksgiving favorites. Items include a carving station with herb and butter roasted turkey breast and prime rib; a selection of hot items including traditional dressing, roasted jalapeno mac and cheese, creamy Parmesan mashed potatoes, garlic green beans and roasted sweet potato; and cold sides include cranberry sauce, Southern-style potato salad and a selection of fresh fruit and cheeses. No meal is complete without a trip to the dessert buffet table with cheesecake bites, chocolate lava cake, pumpkin pie, pecan pie and more. Reservations can be made by calling the respective restaurant. For more information, visit communitashospitality.com. Southern Art is taking the hassle out of holiday baking this year with the debut of Southern Art’s Pie Stop. Throughout the holiday season, Southern Art’s signature homemade pies and made-to-order gourmet cakes, inspired by executive chef Art Smith’s family recipes, are available for pre-order online. Flavors include Georgia Honey and Orange Bundt Cake with a honey glaze, Peanut Butter Pie topped with raspberry jam and Italian meringue, Bourbon Pecan Pie and Classic Pumpkin Pie. Pies on the Pie Stop menu are available for $45 and cakes are $50 each. Orders will be available for curbside pick-up at the InterContinental Buckhead Atlanta valet. Atkins Part Restaurant & Bar in Virginia-Highland is hosting Thanksgiving on Thursday, November 27 from 4-11 p.m. The restaurant offers a traditional meal at $28 for adults, $18 for young adults ages 11 to 16 and $10 for children 10 and under (tax and gratuity not included). Diners can choose between Big Green Egg smoked turkey breast or braised pork shoulder with sides of green bean casserole, roasted garlic mashed potatoes, cranberry Grand Marnier compote and sweet potato biscuits Dessert options include pumpkin cheesecake or Southern pecan pie. Reservations are recommended. For more information, visit atkinspark.com. 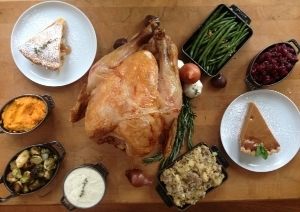 Bantam + Biddy (Crescent location only) is offering catering this Thanksgiving. For $180, the meal includes one 12-15 lb. roasted Amish turkey, classic mashed potatoes, braised collard greens, cornbread, sage and wild rice stuffing, homemade giblet gravy, a quart of spicy cranberry sauce and a North Georgia apple pie. The meal feeds 10-12 people. All orders must be placed by 9 p.m. on Tuesday, November 25 and pick-up is Wednesday, November 26 from 5 p.m. to close. Order can be made by calling 404-835-6450 orwecater@bantamandbiddy.com. Milton’s Cuisine & Cocktails provides a Thanksgiving turkey to-go along with delicious traditional side items for the whole family. Individuals can pre-order their bird now, securing a brined and smoked turkey weighing between 12 and 14 pounds, served along with sage-corn spoonbread. Each turkey serves between six and eight guests, and is priced at $75 per turkey. Additional side items like roasted Brussels sprouts, buttermilk mashed potatoes, cheddar cheese grits, garlic spinach, sautéed green beans and blue cheese mac are available for pre-order purchase. Turkeys can be ordered here and must be placed by Friday, November 21 for pick-up on Tuesday, November 25 and Wednesday, November 26 at the restaurant. For more information, visit miltonscuisine.com. Atlantic Station restaurant, The Pig & the Pearl, offers a full Thanksgiving feast to-go for patrons looking for a delicious and easy way to host family and friends. All items are available a la carte for easy ordering, including a 12 to 14 pound fresh, whole smoked turkey with gravy for only $65 each. Additional sides include cheddar mac and cheese, smoked sweet potatoes, sweet potato pie and a cranberry-apple streusel pie. Each side item feeds between four and six people per order. Guests must pre-order their dinners by Monday, November 24. Place orders by visiting thepigandthepearl.com for more details and pricing. Ray’s Restaurants is offering delicious Thanksgiving buffets at its locations to let everyone get their fill of Turkey Day favorites and signature Ray’s recipes. The buffet will be available at Ray’s on the River from 10 a.m. to 9 p.m. and is priced at $42.95 per adult and $21.95 per child ages five to 10. Ray’s at Killer Creek will begin serving at 10 a.m. until 9 p.m. and is priced at $34.95 per adult and $17.95 per child ages five to 10. Ray’s in the City will open later at 11 a.m. and serve through 4 p.m., offering its regular dinner menu beginning at 5 p.m. along with a la carte pricing and extra Thanksgiving Day special. Pricing is $34.95 per adult and $17.95 per child for the Thanksgiving buffet at Ray’s in the City. For more information, visit raysrestaurants.com. The Shed at Glenwood is inviting guests to join them for a delicious Thanksgiving buffet featuring a selection of savory meats, sides and desserts. Supreme selections including Gum Creek Farms ham, salmon croquettes and fried Springer Mountain chicken, along with sweet potato soufflé, mac and cheese gratin, beet salad and zucchini and squash casseroles. Decadent dessert options include oatmeal and cranberry whoopee pies, red velvet cupcakes and a bourbon-roasted banana pudding. The buffet is priced at $50 per adult and $20 for children ages four to 10, and will be available from 11 a.m. to 6 p.m. Table reservations are strongly encouraged and can be placed online at theshedatglenwood.com. Whole Foods Market is serving as the Thanksgiving destination for Atlantans with fresh offerings that are available for pre-order and pick-up so cooks can spend more time with family and friends than over a stove. Whether hosting a large family gathering or preparing a classic meal for a family of four, the Whole Foods Market Thanksgiving menu has everything necessary for a delicious, traditional holiday meal. Offerings include Turkey Dinner Packages with a pre-cooked turkey with a savory herb rub, plus options of sides like green bean casserole, cranberry-orange relish and homestyle mashed potatoes. Additional sides and starters are also available like a la carte shrimp platters, cheese platters and oysters. Desserts and a selection of Whole Foods’ fresh baked treats including vegan and gluten-free options are the perfect ending to the meal. The Buckhead location of Whole Foods offers a convenient online ordering form and guests can even have their Thanksgiving feast delivered through Instacart to save even more time. For more information on Whole Foods Market’s Thanksgiving Menu, click here. For those interested in just the turkey, Whole Foods Market sells White Oak Pastures free-roaming turkeys. White Oak Pastures turkeys are different from a traditional store bought bird – in fact, the turkeys can fly the day they are harvested and are raised and slaughtered right on the farm. This year, the farm is raising delicious Broad Breasted Bronze, Auburn and Black turkey breeds, and they are available in small, medium and large varieties. These birds are available for purchase for $5.99 per pound at all Atlanta-area Whole Foods Markets. Supplies are limited. For more information about White Oak Pastures turkeys, visit whiteoakpastures.com. Editor’s note: Marissa May, Kelley McLaughlin, and Alez Kukler contributed this post. This looks so yummy! I’ve never heard of BLT Steakhouse, but I’ve heard of many of the other restuarants you listed! This is an awesome guide! !